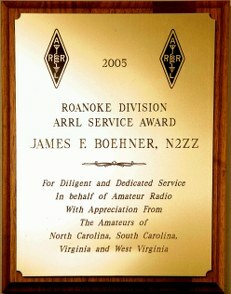 The bestowing of the Roanoke Division ARRL Service Award was begun in 1968 by its founder, then Roanoke Division Director Victor Clark, W4KFC, now a “Silent Key.” Vic intended that the award be presented in recognition for a long history of significant, consistent contribution to Amateur Radio. The ham selected would have, over the years, dedicated much of his or her time to Amateur Radio, and any ham within the Division is welcome to submit a nomination with attached résumé. Nominations are taken between December 15th and January 15th, and the nomination forms are made available then. Winners of the Service Award become members of the selection committee, and they vote on which nominee is to be honored the next year. An individual can receive the award only once. The administration of the award is done by the Roanoke Division Director. Click HERE to view the chronological Honor Roll of recipients of the Roanoke Division ARRL Service Award. Vic Clark himself was presented with the award for 1970. For more about Vic, HERE is an editorial from the January, 1984 issue of “QST” (Reprinted with permission, Copyright 1983, the American Radio Relay League). Miriam Smith, KB4C, was very active in Public Service and Emergency Communications. She was the ARES Emergency Coordinator and RACES Radio Officer for Buncombe County, North Carolina for some time, having been licensed for almost twenty years. Miriam unexpectedly became a “Silent Key” in July of 1995. 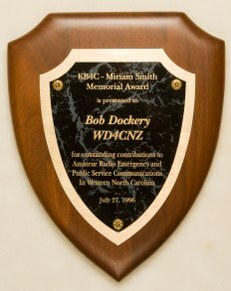 Soon after her demise, an annual award was created in her name by her husband, Carl Smith, N4AA, to honor an Amateur Radio operator from within the sixteen counties of Western North Carolina who demonstrated an active committment to Public Service and Emergency Communication through the ARES/RACES programs. Requests for nominations are sent to the local Emergency Coordinators in early June, and the award plaque is presented to the selected ham at the WCARS Hamfest, which is held in late July. Click HERE to view the chronological Honor Roll of recipients of the Miriam Smith Memorial Award. For more about Miriam, HERE is an article that was published in her club newsletter. Carl became a “Silent Key” on October 20th, 2017. For more about him, HERE is an obituary from the ARRL website. (Reprinted with permission, Copyright 2017, the American Radio Relay League).